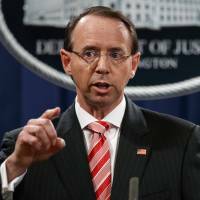 WASHINGTON - U.S. Deputy Attorney General Rod Rosenstein discussed secretly recording President Donald Trump last year amid law enforcement concerns about chaos in the White House, according to people familiar with exchanges at the time. One person who was present said Rosenstein was just being sarcastic. Rosenstein’s comments were first reported Friday by The New York Times. Trump spoke later Friday of a “lingering stench” at the Justice Department, though he didn’t name names. The Times also said Rosenstein raised the idea of using the 25th Amendment to remove Trump as unfit for office. It is also the latest revelation that could affect Robert Mueller, the special counsel investigating possible coordination between Russia and Trump’s presidential campaign in 2016. Sessions recused from that issue soon after he took office, to Trump’s dismay, and Rosenstein later appointed Mueller. With all that hanging in the air, Trump has resisted calls from conservative commentators to fire both Sessions and Rosenstein and appoint someone who would ride herd more closely on Mueller or dismiss him. The reported conversation about possibly secretly recording the president took place at a tense May 2017 meeting during the tumultuous period that followed Trump’s firing of FBI Director James Comey, a decision that upset many rank-and-file agents and that the White House said was based on the Justice Department’s recommendation. Among the participants was Andrew McCabe, the FBI official who was temporarily elevated to director after Comey’s firing and who documented conversations with senior officials, including Rosenstein, in memos that have been provided to Mueller as part of his investigation. The interactions lay bare the conflicts that roiled the FBI and Justice Department early in the Trump administration after Rosenstein, just weeks into his job, wrote a memo critical of Comey’s handling of the Hillary Clinton email server investigation that the White House used as justification for firing the FBI director. Trump told a campaign rally in Missouri that the department has some “great people” but also “some real bad ones.” He said the bad ones are gone, “but there’s a lingering stench and we’re going to get rid of that, too.” It was unclear to whom he was referring. It was difficult amid the conflicting accounts to discern the precise context of Rosenstein’s and how they were intended. “I never pursued or authorized recording the President and any suggestion that I have ever advocated for the removal of the President is absolutely false,” he said in a Friday evening statement. At that point, Rosenstein said to McCabe something to the effect of, “What do you want, you want me to wear a wire?” according to the person. Rosenstein was asked in the meeting if he was serious, and he said yes, but he did not mean for the wire comment to be taken seriously as a tactic to investigate Trump, the person said. The person also said that a memo from McCabe describes Rosenstein as referencing the 25th Amendment to the Constitution, which says that a president can be declared “unable to discharge the powers and duties of his office” upon a majority vote of the vice president and the Cabinet. But the person said notes and recollections from other attendees at the meeting, including former FBI lawyer Lisa Page, do not include the 25th Amendment reference. McCabe’s lawyer, Michael Bromwich, said in a statement that McCabe had drafted memos to “memorialize significant discussions he had with high level officials and preserved them so he would have an accurate, contemporaneous record of those discussions.” He did not address the content of the memos. Rosenstein has been a target of Trump’s ire since appointing Mueller as special counsel last year. He chose Mueller one week after he laid the groundwork for the firing of Comey by writing a sharply critical memo of his performance. The White House initially cited that memo as justification for Comey’s firing, though Trump later said he was thinking about “this Russia thing” when he made the move. 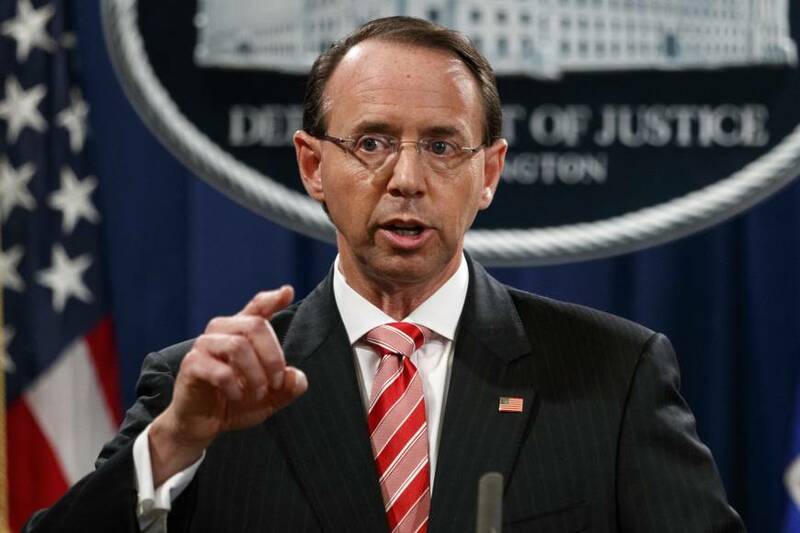 As deputy attorney general, Rosenstein oversees Mueller’s work and has made two public announcements of indictments brought by the special counsel — one against Russians accused of hacking into Democratic email accounts, the other against Russians accused of running a social media troll farm to sway public opinion. The news elicited a quick response from members of Congress.